But then I stumbled across Andreas Hegenberg’s BetterTouchTool (donation requested). The BetterTouchTool utility allows you to define your own gestures and actions. In addition to its not-yet-final support for the Magic Trackpad, BetterTouchTool works with many third-party trackpads and Apple’s Magic Mouse. It even lets you assign various actions to keyboard shortcuts. For me, the key feature was the ability to assign actions to newly-available gestures. This (along with my existing utilities) would allow me to replicate the functionality of my multi-button mouse while gaining the gesture features of the Magic Trackpad. 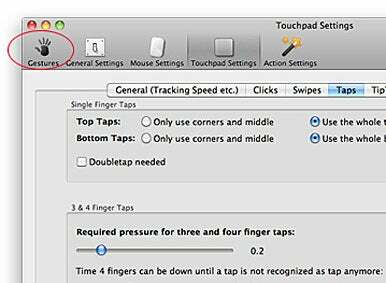 Here’s how to set up a Magic Trackpad using BetterTouchTool to add virtual mouse buttons. BetterTouchTool is powerful, but the setup screens can be a bit intimidating. Ignore all this and click on Gestures (circled). After you’ve downloaded BetterTouchTool, launch it. A new icon will appear on the right side of your Mac’s menu bar at the top of the screen. Click on this and select Preferences to access the program’s settings. With over 50 available gestures, and support for multiple devices with myriad settings available, the BetterTouchTool interface can be a bit intimidating. There are multiple tabs in most every settings panel, and the actual layout of the elements can seem a bit daunting. The good news is that you can ignore most of the interface, focusing just on the Gestures panel. Click on Gestures at the top of the window to reveal it. To make your gestures work everywhere, select Global in the Select Application column and then click on the Add New Gesture button. BetterTouchTool lets you create global gestures—gestures that work no matter what application you’re in—or gestures that work only in defined applications. As I wanted my virtual buttons to work anywhere, I created global gestures. With Global selected in the Select Application column, click on the Add New Gesture button. After perusing the huge list of options in the Touchpad Gesture menu, I chose to use single-finger taps to best emulate traditional mouse buttons. The menu gives you eight choices for single-finger taps—each in a location around the perimeter of the Magic Trackpad (for example, Single Finger Tap Top Left). At first, I chose to require the Control key, but over time, I got better at accurately tapping the trackpad. Eventually I was able to remove the Control key requirement. My virtual buttons now activate with simple taps. Not sure what to assign to your trackpad’s virtual button? 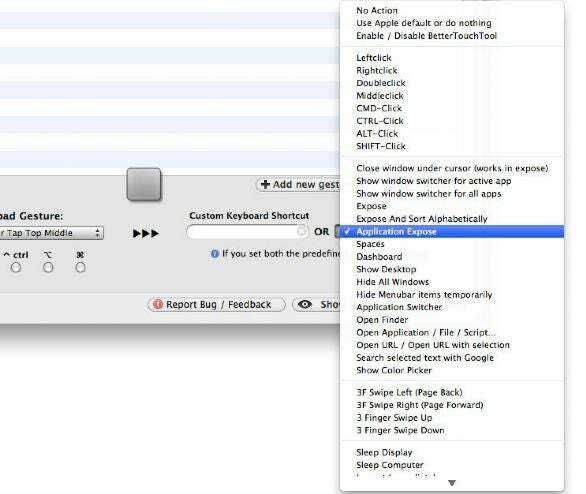 You can choose from dozens of options in BetterTouchTool’s Predefined Action menu. For instance, assign a tap to Application Expose, Show Desktop, Spaces, or Eject. The current program’s menu bar A tap at the left side middle gives me the current program’s menu bar, in a pop-up menu under the mouse button. 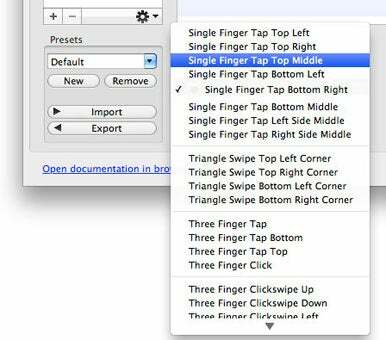 I did this by assigning a custom keyboard shortcut in BetterTouchTool to that left-side tap. In this case, Control-Option-M, which activates the handy (but no longer updated) utility DejaMenu. Alternatively, you could use MenuPop ( ) to do this. A window switching panel A right-middle tap displays Many Tricks’ Witch ( ) window switching panel, making it simple to switch to any open window in any application. I assigned the Option-Tab hot key—my Witch activation shortcut—to this region in BetterTouchTool. Often-used folders A bottom-left tap brings up a hierarchical menu containing my often-used folders, so I can quickly drill down and open any of my most-used files. I used Many Tricks’ utility Butler ( ) to define this action and give it a keyboard shortcut, which I then mapped in BetterTouchTool. A Google search window A bottom-right tap displays a Google Web search window, so I can submit Google searches without first switching to my browser. This, too, is done via a Butler shortcut that’s mapped into BetterTouchTool. Help Finally, I use the top-right corner to bring up an application’s Help menu—this is done by simply mapping the nearly-universal Help shortcut (Shift-Command-/) to that tap location. This composite image shows the five tasks assigned to the virtual buttons on my Magic Trackpad. For my needs, I’ve found that this combination of the Magic TrackPad, BetterTouchTool, and some utilities is the perfect mouse replacement. My wrist is much happier now that it doesn’t have to flick a mouse across my three connected displays. I’ve lost none of the multi-button powers of my mouse, and the added gesture-specific features of the Magic Trackpad let me do even more with it than I could with my mouse. While this solution may not be for everyone, if you’re addicted to your programmed mouse buttons, it’s a great way to put the Magic Trackpad to use without giving up any capabilities. 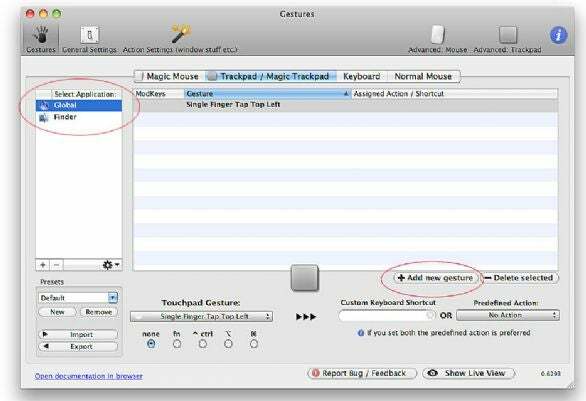 Macworld senior contributor Rob Griffiths is Master of Ceremonies at Many Tricks—creators of Butler and Witch, both mentioned in this article.